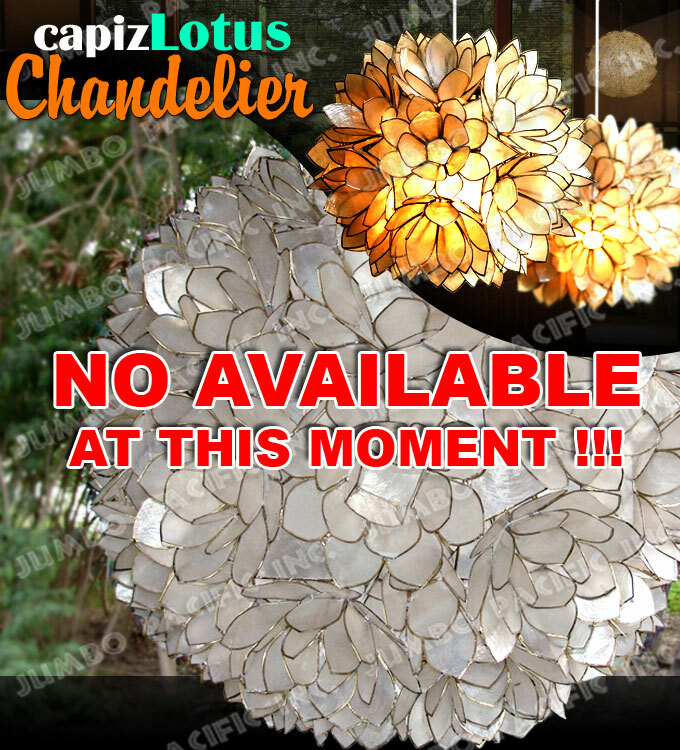 Capiz Lights is probably the leading manufacturer and wholesaler of all handmade capiz lights product like Table and floor Lamp Shades, Capiz Chandeliers, Capiz Curtain and all Capiz lighting home decoration made of Capiz chips and Capiz Strands. Design perfectly for your home decoration needs and its very popular and affordable because made in capiz shell to look classical, luxurious and elegant lighting decoration. Capiz Lights is under Jumbo Pacific Inc. the leading exporter of all fashion jewelry, fashion accessories and shell jewelry in Cebu Philippines. We design and manufacture quality custom made fashion jewelry products and accessories for you daily fashion needs. Our designs are unique which are crafted and handmade by our finest fashion designers. We use quality and natural materials to make our product natural looking. Shells is a very popular material that is use in making fashion jewelry and accessories. These shells are made into heishe, pukalet, inlay, pendant and combined with other natural materials to make such beautiful and exotic fashion jewelry like necklaces, bracelets, bangles, anklets, brooches, button, hair ornaments, earrings, rings and lot more. There are lots of popular materials that are use like coco, wood, seeds, kukui nut, bamboo, rattan, stone, raffia, magnetic material, metal and resin. Jumbo Pacific Inc. have lots of Philippine products to offer not fashion jewelry and accessories. We also design and manufacture shell tiles, gift items and novelties, home decors, Capiz Lights, jewelry boxes, shell specimen, Philippine crafts, shell inlays and etc. These products are made from the finest natural materials for export quality. Shells, wood, coco bamboo and other natural materials are processed and polished to make such beautiful and exquisite products. Jumbo Pacific Inc., is probably the finest and one of the top quality exporter of all Philippine products like shell jewelry, fashion accessories, fashion jewelry, home decoration, novelty, souvenirs and many more. We also create and manufacture the products with your own specifications and design. Our high standard of making these products is our legacy. In this we give you the top quality fashion shell jewelry and fashion accessories products at affordable prices. Note: All shells are legally BFAR and U.S. wildlife approved before shipping. Capiz Lotus Chandelier in flower 1007 petals design. Click to view..
Capiz Globe Chandelier in round globe design. Click to view.. If you are END user, click here to BUY online Capiz Lights Lamps Decoration. 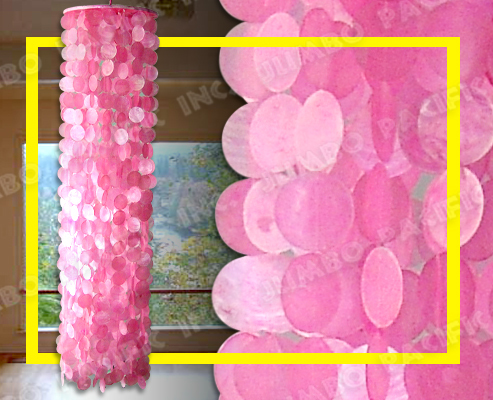 NEW Added Pink Chandelier price and product details . click here!!! 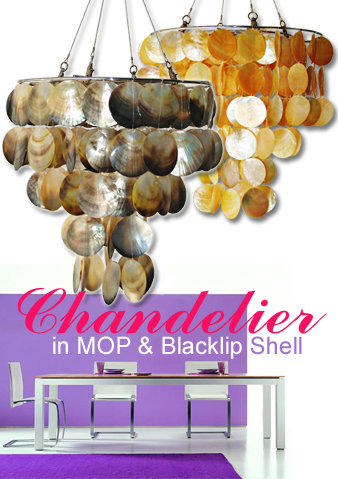 Hanging Lamps in MOP & Blacklip Seashell chips. You can choose what shell you like. click here..